Well, now, another day, and another promise from my list of New Year's Resolutions to fulfill. I must admit, in all the twice-a-month Incredible Hulks hoopla, I've been remiss in reviewing that other Hulk book that's been haunting the newssstands--you know, the one that, up until lately, had been Jeph Loeb and Ed McGuinness' personal toybox for all their Hulkish ideas and which had introduced the Red Hulk to the comic buying public. Well, as I reported before I went to New York Comic-Con, writer Jeff Parker, artist Gabriel Hardman, and colorista Bettie Breitweiser have lent their considerable talents to the Red Hulk's book upon Loeb & McGuinness' departure. A few months later, here I am finally reviewing the first story arc. Hopefully I'll bring to the fore some things you didn't see on the first pass. 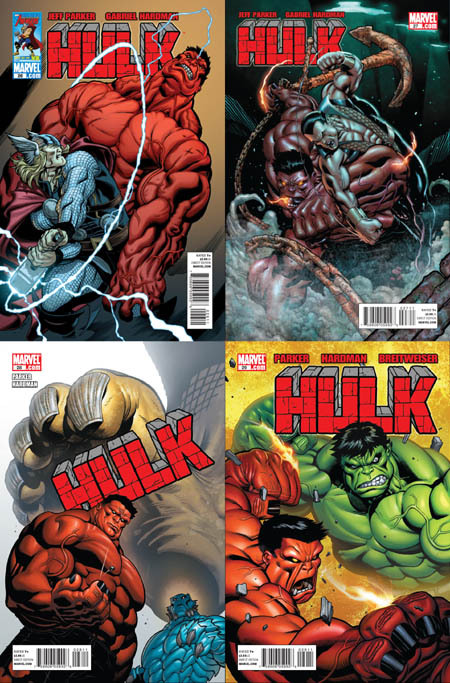 Covers to Hulk #26-29 by Ed McGuinness, easing the transition to interior artist Gabriel Hardman. Alas, the first arc of the Parker/Hardman/Breitweiser Hulk era is finished. One arc into the Loeb/McGuinness run, people were upset about Red Hulk beating up all their favorite heroes, and upset because they didn't learn his real identity at the conclusion of that sixth story. So what's the dirt on this arc, "Scorched Earth"? I'm loath to admit at the risk of shooting my wad too early, but Hulk under the new team perfectly captures the old-school feel of the best Hulk epics of yesteryear while giving a modern spin. While showing echoes of Banner and the green Hulk, "Thunderbolt" Ross is his own monster, with his own methods, and in some ways, the book outperforms Greg Pak's companion title. I know you want me to put my money where my mouth is, because granted, that's a pretty bold statement to make. I'll start with the fact that "Scorched Earth" is the most direct epilogue to the events of the last six months' worth of Hulk stories. The premise here is elegantly simple, in that M.O.D.O.K. and the Leader set in motion a "doomsday scenario," aptly titled "Scorched Earth," in case they were captured or killed during "World War Hulks." While Bruce Banner works from the converted former A.I.M. outpost at Gamma Base to isolate and stop the ongoing attacks, he and Steve Rogers send Ross on related missions alongside some of Earth's most powerful heroes. In the back-up tales throughout #25-27, Banner also sends his best friend Rick Jones, a.k.a. A-Bomb, on a mission which dovetails with the main storyline and leads to its inevitable conclusion. While the storyline starts off as little more than an apparent means of having all the heroes Red Hulk beat throughout his run take their revenge shots, thankfully it proves to be more than that under writer Jeff Parker's capable hands. To be fair, the hero-versus-hero fights became formulaic by the time Namor cornered the Red Hulk deep under the sea at the end of issue #27. (In spite of the formula, the Red Hulk vs. Thor fight in issue #26 was a definite highlight, made better still by Thor's admission to Banner after its climax.) Parker wisely shifts focus for the last two parts of the storyline, unifying the story with the A-Bomb back-ups. The obligatory fight between Red Hulk and A-Bomb feels less like another revenge beating because, simply, it's not, instead relying on another tried-and-true trope, namely mind control. Again, the fight doesn't last long, but it leaves Red Hulk overheated and changing back to Ross. Hence we transition to the final conflict, wherein a big secret about the Red Hulk's powers is revealed. I've had a bit of an argument with Ratchet from his Hulk Collection blog about the turn that occurred in the last issue (SPOILER goggles on for this paragraph!) It's first hinted at when, as soon as the Hulk appears on Monster Isle, Ross is able to overcome his weakness and immediately change back to the Red Hulk. The Hulk reveals that Banner lied to Ross, and that he never lost his energy-absorbing abilities. Later in the story, when confronted with his betrayal, Banner admits the lie but states he did it to save Ross. Parker smartly sets up a likely hook for an eventual Red Hulk power-down because if Ross continues to use those energy absorption abilities, he risks losing one of his two forms--and Banner doesn't know which one it will be. Now, whereas my fellow blogger thinks this development is awfully convenient, I'm of the mind that it's very smart, taking the decision that had in #25 been out of Ross' hands and putting it squarely back in them. Each time he uses that power that differentiates him from the original Hulk, he risks either being trapped as man or monster forever. Conceptually it is sound, and certainly makes more sense than saying Banner suddenly learned how to perform brain surgery overnight. Consequently, it does make Betty Banner's situation as Red She-Hulk more interesting if these same elements are indeed in play over in Pak's Incredible Hulks in months to come. I've been going on and on about the story and the subtle nuances amid the bombast that I nearly forgot to mention the tremendous artistic talents of both Gabriel Hardman, whom I had the pleasure of meeting in New York in October, and Bettie Breitweiser. Yes, Gabe's artwork is a 180-degree turn from the sleek, stylish quality of Ed McGuinness' (no doubt why McGuinness has stayed on board to provide covers, as a means of easing the transition). But the man can draw anything, and I do mean anything. And if his art wasn't dynamic all by itself, the added artistry of Bettie Breitweiser just completes the package. That's right, I said artistry, as she brings more to the table than virtually any colorist out there, stunningly finishing pages that looked damned gorgeous and complete in ordinary black-and-white! (I should know, as I've seen many of Gabe's inked pages in New York. You can, too, right here.) At times, it's incredibly hard to believe that these pages are colored on a computer and not by hand. Lofty praise indeed. (There are pages Gabe drew that Bettie didn't ink. They're in #29 and they stick out like a sore thumb.) Simply put, I hope the Hardman/Breitweiser team sticks together a long, long time. My only complaints, honestly, have more to do with nitpicks than any actual story problems: The Leader's human self is routinely referred to as Sam Stearns, and the final issue's chapter five is mislabeled as four, while chapter two's credits were left out of the issue entirely. However, I'm sure Marvel can get this product under control swiftly. So, what do we have in the total of "Scorched Earth"? A solid start to the next major era of the Red Hulk, with an impressive, meaty plot; a smart, savvy script; and breathtakingly gorgeous artwork befitting Marvel's foremost crimson rampager. Look closer, and you'll see the development of at least two villains soon to face off against ol' Thunderbolt. (One, the Omegex in #29, is obvious, while the other--Zero/One--is more subtly shown in issues #25-26.) There's enough story fodder here to keep things going for at least a year. Overall, Jeff Parker, Gabriel Hardman and Bettie Breitweiser are poised to steamroll forward past their inaugural collaborations on Atlas, and I for one can't wait to see what they do next. Red Hulk: Scorched Earth may be coming in trade paperback to a comic shop near you in April 2011, but don't wait--pick these issues up now. Nice to see that I am not the only who as being enjoying this series. Now with obligatory first story arc out of the way, Parker can craft the stories and characters that he wants to write about (see the new upcoming villains that he as created to give our boy a run for his money!). I wish the collected version of this arc was available in hardcover, so as to match my other Hulk trades. So I just ordered this based on your positive review, but I'm glad you warned me about the horrible oversight of Sam "Stearns" name spelling, which would've given me a stroke had I not been warned. Very thoughtful review, Gary! You're a helluva writer.